Situated within the Pudong Park in Lujiazui, Pudong New Area, Oriental Pearl TV Tower, with a giddy height of 468 meters, is the world's third tallest TV tower after the 553-meter CN Tower in Toronto and the 535-meter Moscow TV Tower. With a unique design composed of balls and columns, the tower has become Shanghai's newest landmark and a big magnet for tourists. The designers magically set the eleven beautiful spheres of various sizes up from the green grassland to the blue sky with two giant spheres shining like two rubies. The whole design is rich in poetic and pictorial splendor, which gives the tourist the impression that pearls of various sizes are dropping onto the emerald plate. The Oriental Pearl Tower consists of three big columns, which are 9 meters in diameter, the space module, the upper sphere, the lower sphere, five small spheres, tower base and the square. In the tower, there is a double-decker elevator, which can hold fifty people at a time, and a two-speed elevator that can run at a speed of 7 meters per second. The tower is equipped with three-dimensional lighting installation, which makes the whole tower very colorful and beautiful. The sightseeing floor in the brilliant upper sphere is 263 meters high and 45 meters in diameter; it is the best place to get a bird's eye-view of Shanghai. When it is sunny, it makes one relaxed and happy to see the distant views of the Sheshan, the Chongming Island and the Yangtze River. In the upper sphere, there are also the Revolving Restaurant, the Disco Hall, the Piano Bar and twenty KTV rooms. The Space module, with a height of 350 meters, towers into the sky. Inside of this is set the Sightseeing Floor, Conference Hall and Coffee Bar. They are elegant and luxurious, enjoying exceptional advantages. In the five spheres is the space hotel with twenty comfortable suites, 140 to 230 meters above the ground. It does give people a feeling of being on a spaceship. Up here, guests can sit in sofas and enjoy a bird's-eye-view of the city aloft from the bustling life in the streets. Each ball has a suite and three standard rooms on two levels connected by a winding stairway. 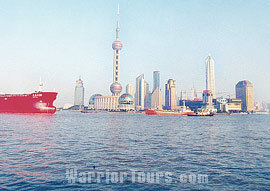 The suite has a private lounge overlooking the Huangpu River and a booming Pudong. Three other rooms share two lounges facing the main section of the Bund and the city's old districts. If you decide to stay, make sure to rent a telescope at the reception desk so you can zoom in on the city's interesting spots. The space city is in the lower spheroid of the Oriental Pearl Tower and the science fantasy city is in the base of the tower. 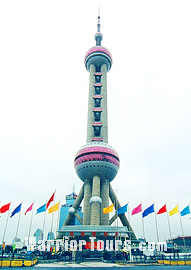 The Oriental Pearl Tower is a multi-functional establishment satisfying various needs in tourism, dining, shopping, entertainment, boarding and Audio & Video Broadcasting. It has already become one of the symbolic buildings and tourism resorts in Shanghai and is honored as one of the ten best views in Shanghai.